Where would a writer never want to live? A writer’s block! See what I did there? There’s nothing quite like a witty joke to reel a reader in. And reeling in a reader is exactly what you need to do with each page of copy you create. From the beginning, your website or blog content must captivate your reader’s attention to truly communicate your message. Why? Because a majority (55%) of readers will only read a blog post for 15 seconds or less. You have only mere seconds to grab their attention and keep it. What Is a Hook and Why Do You Need It? To grab your reader’s attention from the start, you need a good hook. A hook is also known as an opening statement of a piece of copy—the first few moments where your reader decides if they’re committed to the read. It creates anticipation. A good hook motivates your reader to find out what comes next. It provides space for personality. Want to show off your funny side? A hook can do that. It’s the perfect place to show off your unique personality from the start. It helps set the tone. Whether the copy to follow is serious or lighthearted, a hook helps to set the tone, preparing the reader for what comes next. It explains the purpose. A hook tells the purpose of your copy, helping the reader decide if they’ve found what they’re looking for almost immediately. The possibilities are truly endless when it comes to writing hooks for your content. There’s only one true goal: make an impact on your reader in the first few moments. There’s something about making a big claim that begs for attention. There’s a need for you to explain yourself to your reader, pushing them to continue. This can be used on your website pages to reveal one of the problems you solve for your customers. It can also be used in your blog posts to state a fact your audience might find intriguing. One thing is for certain, your reader will crave to know the “why” or “how” behind your claim. Just like we opened our blog post with a (cheesy) joke, being witty is nothing to shy away from. Your personality is unique and sets you apart from your competition. Starting a blog post with a joke that makes your reader giggle or laugh out loud is a great attention grabber. Plus, everyone can always benefit from a laugh. Some information is difficult to understand, especially for more technical topics. Try putting a fresh spin on your topic by using a metaphor or analogy for your audience to better understand. Showing an idea in a fresh way captivates your reader into wanting to know even more. Visitors to your website or blog want to relate to you before they buy. In fact, more than 73% of consumers think transparency is more important than the price of your service. In your website or blog, telling a personal and true story not only grabs attention, but it builds trust in your brand. Need Help Captivating Your Audience? 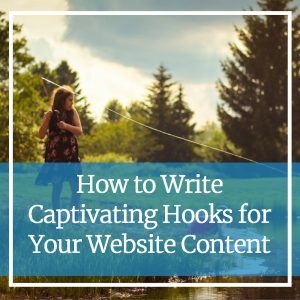 When writing great website or blog copy, writing a hook is the perfect place to start, no pun intended. If you’re struggling to captivate your audience online, a professional copywriter can help. To learn more about writing great hooks or for help, reach out to our team!